When you entrust your children to a child care centre, you want that centre to help your child grow, not just to provide more playtime. At Brant Children's Centre in Burlington, your children will benefit from an innovative program that helps them cultivate a love for learning – and they'll experience plenty of fun along the way. 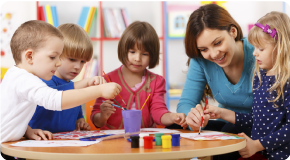 Our child care centre in Burlington accepts students from age 1 to 11, offering structured learning environments in which your children will learn from our enriched academic curriculum. We focus on teaching children to read and develop basic math concepts while incorporating many enrichment activities such as French, Roots & Shoots, swimming lessons and more. Our program is led by a full-time director with a PhD and over 37 years of experience. At our child care centre, your children can explore diverse interests through our Enriched Academic Curriculum. The differing programs found at our child care centre in Burlignton encompasses many of the core components developed by the Ministry of Education, but builds upon them; strengthening the core foundations of these varying programs. Our Main Child Care Centre in Burlington, located at 3180 New Street, is an air-conditioned, independent building. It includes eight classrooms for different age groups, a computer lab for our Kindergarten program, and a large lobby where much activity takes place during the day. Outside are five adventure playgrounds. Outside play is very important at Brant. Our meals and snacks are prepared on site. We have two resident Golden Retrievers that the children adore. We have over 37 years of experience. Our satellite child care centre in Burlington, offers a Morning Pre-School program, Before and After School programs, and Summer Adventure Camps for school-aged children. No matter which program you need for your child, you can depend on our child care centre in Burlington deliver quality care and innovative programming so they can succeed in an every changing environment. We’ve worked hard to make Brant Children’s Centre in Burlington “a happy place to grow and learn”. Come and take a tour of our facilities so you can experience what we have to offer. Simply call 905-634-5518 to arrange a time.